Win a ring, take a bride. Jason Kidd is on a roll. He won his first NBA Championship in June with the Dallas Mavericks and on 9.10.11 he married his fiancé Porschla Coleman. Porschla’s dress is pretty from this angle. I know she looked amazing in it — Porschla is a former model and certified instructor of Jivamukti Yoga. 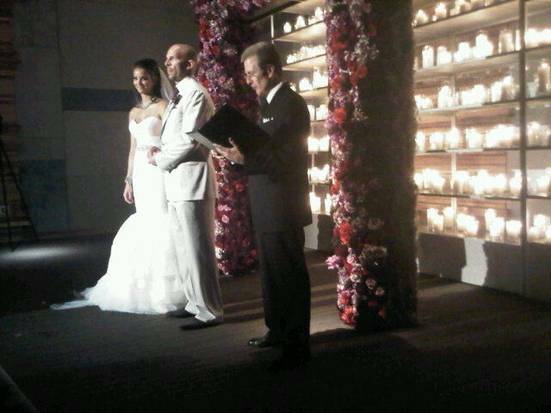 The wall of lit candles was a beautiful backdrop for their ceremony. Here’s a video of Jason, accompanied by Porschla during ESPY week in July, speaking about the championship and the wedding…. Jason and Porschla are proud parents to a son born in January 2010. Jason also has a son, Jason Jr., from aprevious relationship, and a son, Trey, and two daughters, twins Miah and Jazelle with ex-wife Joumana Kidd.